Decorating is permitted with some restrictions and as directed by the Park Director. "all we ask is that you will leave the Park in the same or in a better condition"
How many Picnic Table do you have? We have 12 large Picnic Tables located in the Large Pavilion. Most are 30 inches wide by 96 inches long. Each can seat between 8 and 10 people. Can we relocate them for our event? Yes you can, however - all we ask is that you put them back after your event. Can we bring or rent tables and chairs? Sure. Please make arrangements with the Caretaker to schedule delivery, pickup and storage. Do you have electricity available? Limited electricity available and should be discussed with the Caretaker before making arrangements. - Men's Room with 2 stalls, 2 urinals and 2 Sinks. 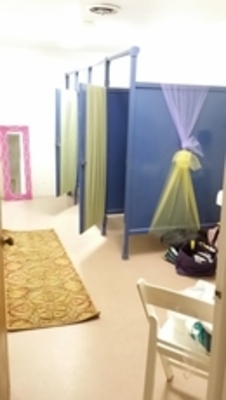 - Woman's Room with 4 Stalls and 2 Sinks. 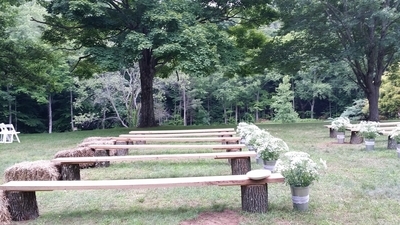 Do you have Benches for our wedding? The benches you see in the photographs were made on site by one of our guests who was kind enough to donate them for others to use. We do have the pieces for your use. All we ask is that you clean up after you are done. 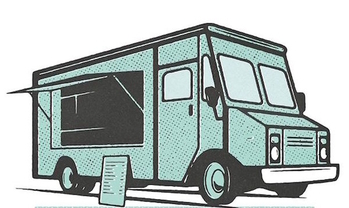 Yes, in fact, encouraged, we have had a great deal of success with fool trucks since our Kitchen is used for staging and serving not for cooking.